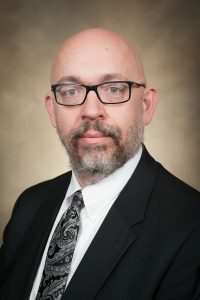 Robert McKinney, assistant professor of social work in the department of psychiatry and behavioral medicine at The University of Alabama’s College of Community Health Sciences, was among 16 faculty nationwide chosen for the 2018 class of the Society of Teachers in Family Medicine’s Behavioral Science/Family Systems Educator Fellowship. McKinney is also director of the University Medical Center department of social services, where he supervises social work field students in clinical training environments and teaches them about the social determinants of health and mental health. The competitive, yearlong STFM fellowship is for faculty with responsibility for coordinating or teaching the behavioral science/family systems curriculum. The fellowship helps participants better understand the medical culture, integrate behavioral science and family systems core principles into the practice of family medicine, and grow professionally through mentoring relationships with seasoned behavioral science/family systems educators. Fellows are also required to plan, create and present a scholarly project at a national conference. McKinney earned an undergraduate degree in philosophy from Mississippi State University, and completed his master’s in social work degree at The University of Alabama. His professional experience includes direct clinical practice with children, adolescents and their families at Indian Rivers Community Mental Health Center in Tuscaloosa, and he was assistant director of Tuscaloosa Family Resource Center, also in Tuscaloosa. He is one of fewer than 50 people in Alabama to be licensed and certified for private, independent practice by the Alabama State Board of Social Work Examiners in all five recognized areas of practice: clinical social work, community organization, social casework, social work administration and social work research. McKinney is currently a doctoral candidate at UA’s School of Social Work.